The company behind a visionary, one-of-a-kind engineering project in North Wales has revealed some of the details behind the unique machinery and technology that will transform a redundant former aluminium quarry in Snowdonia into the first inland surf lagoon of its kind. Until now, the precise detail behind Surf Snowdonia’s state-of-the-art patented technology has been closely guarded. The concept has been developed and refined over the last ten years by Spanish company Wavegarden®, a group of hydrological, civil and mechanical engineers who also happen to be passionate surfers. R&D spend to date is in the tens of millions of euros. The operation to lift the innovative machinery into position at the construction site in the village of Dolgarrog has just been completed to schedule. 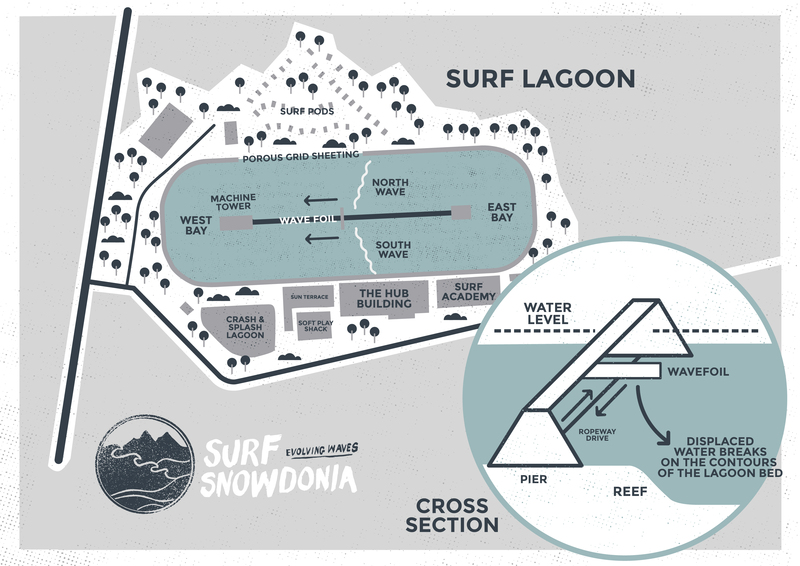 Conwy Adventure Leisure Limited (CAL Ltd), the company who has delivered the vision and the capital for the £12m Surf Snowdonia project, has made the decision to reveal some detail about the mechanics and technology that will generate the longest man-made waves in the world. CAL Ltd, which is allied to the Ainscough Group, has also given details of a unique grid-like shore lining which will help to dissipate the energy of the waves and enable the facility to generate waves at a highly efficient rate of one per minute. Managing director at CAL Ltd, Steve Davies said: “There has been a lot of interest in what we’re doing because this is a ground-breaking project on so many different levels and the only one of its kind. A wavefoil that resembles a snowplough will shuttle back and forth along a central underwater track which runs the length of the 300m lagoon. As the machinery moves back and forth it will generate a barrelling wave on each side of the track. The waves will interact with the contours on the bed of the lagoon to provide various wave profiles at different points in the lagoon. The waves will be variously 2m, 1.2m and 70cm high, and will peel for up to 150 metres. That’s the equivalent of a 20-second ride for the surfer on the wave. The wavefoil will be controlled using computer-based technology housed in towers at either end of the central pier. A gearless ropeway drive system inspired by ski lift technology will move the wavefoil back and forth across the length of the lagoon at the touch of button. The system is capable of producing the longest man-made waves in the world which hold their power and form over any distance. The lagoon’s shore will be fitted with a porous grid sheeting which will help to dissipate the energy of the wave much more quickly than an impermeable perimeter would. This will allow for a highly efficient turnaround of the wave machinery, allowing it to generate waves at the rate of one per minute. The central underwater machinery will be covered with a protective stainless steel netted screen, to keep surfers safe from the moving parts without impairing the energy of the waves. The steel screen will be covered above water level by a wooden pier structure. Before the Surf Snowdonia site was developed by CAL Ltd, it was a derelict industrial wasteland. Over 25,000 cubic metres of onsite material has been crushed and reused during the construction, and 400 tonnes of steel, cast iron and copper have been recycled. One hundred years’ worth of industrial waste and contamination was removed from the site ahead of its development. 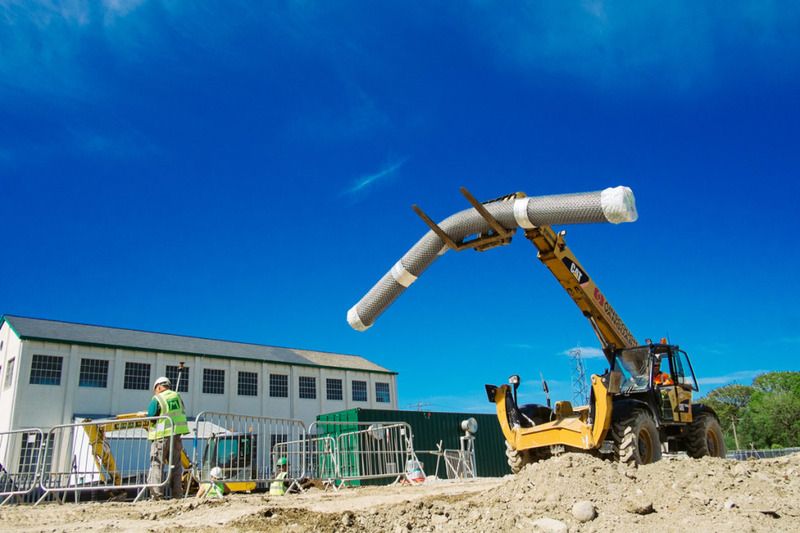 Surf Snowdonia will be filled using rainwater from nearby mountain reservoirs. Rigorous testing has shown that there is no perceivable difference in surf-ability or buoyancy when it comes to using fresh water over salt water. In what is a highly sustainable and efficient water cycle, the water will pass through a neighbouring hydroelectric plant before powering the waves in the lagoon. It will be cleaned using UV disinfection and filtration, so the facility will be chlorine-free. According to Steve Davies, the project has benefitted from a flexible and collegiate approach between contractors. He added: “Nothing of this nature has never been done before, so we have all had to be willing to adapt our plans as we’ve progressed the build. Up to 52 surfers at a time will be able to ride the waves, with different areas of the lagoon suitable for different abilities. The facility is conservatively expected to attract in excess of 75,000 visitors per year to North Wales. It is due to open on Saturday 1 August, 2015. Surf Snowdonia will create over 60 direct jobs, additionally sustaining around 100 jobs in the supply chain.